On 23 May 2014 one of the most beautiful buildings in the UK - the Glasgow School of Art's Mackintosh building - suffered a very serious fire. Designed by native Glaswegian Charles Rennie Mackintosh and built between 1897 and 1909, the GSofA is an incredible example of Art Nouveau architecture as well as a space designed meticulously for its purpose as an art school. The Glasgow School of Art was awarded 'The Stirling of Stirlings' when it won a public vote run by the RIBA in 2009 to find the best building in Britain. It's a building I've admired for a long time and one I feel - especially now - so lucky to have visited. ...the most amazing, almost miraculous news is that the majority of the building is still intact. Due to one of the most astonishingly intelligent and professional pieces of strategy by the fire services, they succeeded in protecting the vast majority of the building, apparently by forming a human wall of fire-fighters up the west end of the main staircase and containing the fire. Also after ensuring no lives were in peril they displayed an impressive understanding of the precious nature of the building, and due to their careful and meticulous handling of each developing situation the damage is considerably less than we dreaded. We have run out of words with which to thank them, but the school has most certainly gained a new gallery of heroes. While much of the building and its contents are saveable, the School's iconic library has been lost. Many students have also lost a considerable amount of their work, many at a crucial point in their emerging careers. Today it was announced that with the support of the Scottish Government, the Glasgow School of Art will be awarding a number of Phoenix bursaries to students most affected by the fire, providing support in order for these students to rebuild their portfolios. The Scottish Government will also match fund the School up to £5 million in the first instance in order to begin restorative work on the building, in addition to longer-term funding requirements for building recovery and restoration. Following what the School has called an 'enormous response' from supporters, alumni, the Scottish community and the wider world, the GSofA is accepting donations to go towards the restoration of the building, the conservation of its contents and support for its students. The School also suggests that if you'd like to participate or offer help in other ways, you can contact Director of Development, Alan Horn. Whether or not you are in a position to help the Glasgow School of Art, I'm sure you'll join me in thanking the Scottish Fire and Rescue Service for not only ensuring the safety of all staff and students at the GSofA but for working so hard to save as much of this wonderful building and its contents as possible. 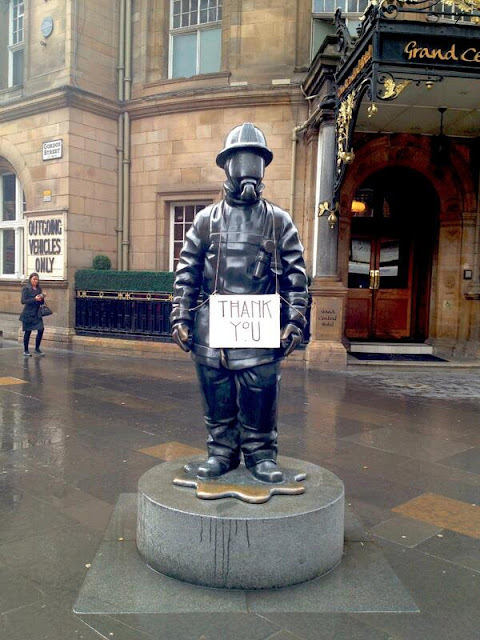 The image above is of a sculpture - Citizen Firefighter - on Gordon Street in Glasgow by GSofA alumnus Kenny Hunter. It was pictured yesterday with a touching addition illustrating the gratitude so many people feel for those who helped save the Glasgow School of Art. Architecture awards season is coming around, and the Scottish Fire and Rescue Service deserve to win all of them.